That jolly old man goes down the chimney with ease. He shouts "Merry Christmas Everybody," before slipping out of sight. Being Santa Claus is no easy task. There's all those toys needing to be made, those whining competitive reindeer to tend to, freezing cold weather to deal with, all those letters and that heart wrenching naughty and nice list to go over. Then there's that annoying Elves' Union and all its benefits to maintain plus their internal bickering and personality conflicts. Thank goodness Mrs. Claus is here to help me sort things out; order just seems to come natural to her. Three hundred and sixty four days of drudgery each year, all for one special night, drudgery might be a little strong, Mrs. Claus says I should consider it a labor of love, the dear heart, she's always right. I want to thank all the folks at Chimney Rock at Chimney Rock State Park for once again inviting Mrs. Claus and myself to your beautiful stone mountainside in Western North Carolina. I always look forward to your warmer southern weather, your friendly smiles and all those lovely guests you invite to cheer me on during my two days of chimney rappelling exercises at your fine facility. It is always a pleasure to be a part of your Christmas Holiday celebration. 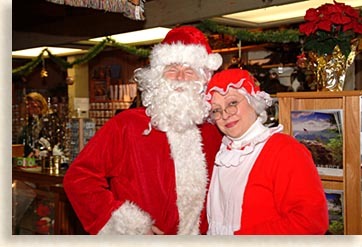 Mrs. Claus and I regard the entire staff at Chimney Rock to be at the top of my nice list. 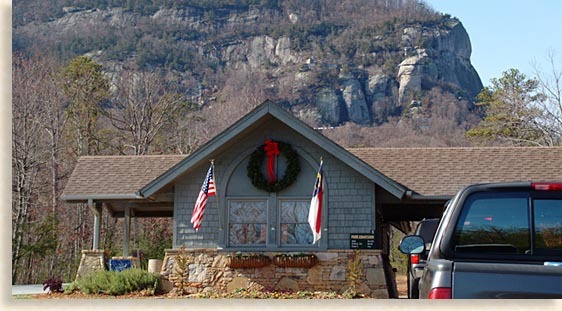 Mrs. Highlander and I would also like to thank the staff at Chimney Rock at Chimney Rock State Park for inviting the Blue Ridge Highlander travel, recreation and relocation magazine to this special holiday event. Its great to get to see Santa once again, we haven't seen him for many years nor have our daughter and son-in-law. Our granddaughter Maddie has been informing us that Santa's doing just fine and looks great, she says, "He thinks he's so quiet but he's really not." 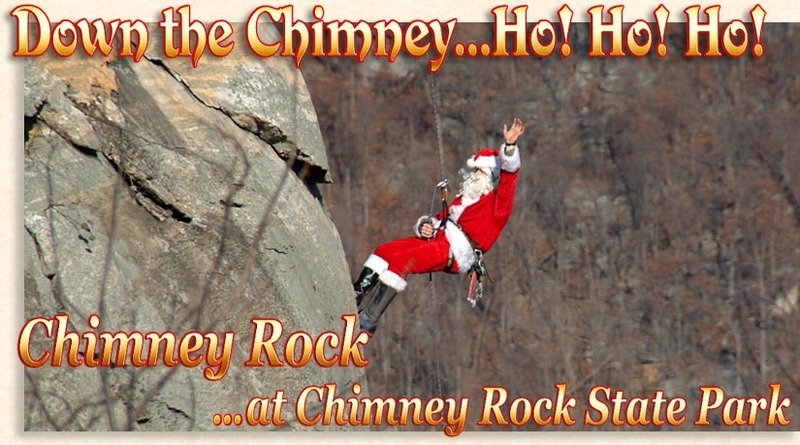 We arrived at Chimney Rock at noon to partake in Santa's chimney rappelling event or should I say cover the festivities. Each year on the first and second Saturday of December between the hours of 11a.m. and 2 p.m., the big jolly red one trains for his yearly chimney descents around the world by rappelling down the tall, free standing stone pinnacle known as Chimney Rock. To access Chimney Rock State Park we took US Route 74A to the town of Chimney Rock just next door to Lake Lure. The entrance gate is on the south side of the highway right in the center of town. A long winding 3-mile drive along a paved roadway from the entrance gate will take you to the base of Chimney Rock. About halfway up the drive we arrived at the Ticket Plaza, from there we could see a number of cars high above along the cliffs, lining the parking area just below the chimney top at the Cliff Dwellers gift shop. After leaving the Ticket Plaza we continued along the 3-mile approach road through a series of twists, turns and switchbacks, the drive itself is one of the enjoyable parts of the trip. We arrived at the parking area and slipped in between a couple of cars, parked and headed over to the tunnel entrance for the elevator. The trail to the top of Chimney Rock is just past the Cliff Dwellers gift shop. The trail leads to a series of stairs that climb along the towering rock chimney; this trail is an exciting way to experience the journey up to the top of Chimney Rock. Mrs. Highlander and I have used this route many times enjoying all the rock formations and natural caves along the way, although this time we chose the easier route using the elevator...ah, the joy of modern conveniences. The long tunnel to the elevator and the elevator shaft are cut through solid rock. The elevator shaft itself is 26-stories tall and opens into the Sky Lounge Gift Shop & Deli. As we exit the elevator into the gift shop we find ourselves distracted by the many special gifts and souvenirs. Passing thru the deli making our way to the exit door, we find ourselves captivated by delightful smells of baked pretzels, pizza and sub-sandwiches, a welcoming reminder that it's just past noon and we haven't eaten yet. Exiting the Sky Lounge Gift Shop and Deli we accessed onto a level wooden deck that led to the Chimney Rock tower ahead. Commanding a position between the rock tower and the gift shop is the "dear heart herself," Mrs. Claus, or for the benefit of our modern day feminist, Ms. Claus. Her friendly smile and her warm affectionate greeting, welcomed us to this very special event. I could see from a distance Mr. Claus was busying himself along the top level of Chimney Rock, talking with the guests and preparing for another run down the perilous rock wall. Mrs. Highlander and I watched as Mrs. Claus greeted all her guest taking this special time to talk to all the children who came to see today's event. "Now be sure to leave Santa some healthy cookies and milk, and don't forget to leave carrots for the reindeer," she said. Waiting for the right opportunity, we moved in to meet with Mrs. Claus, you're never too old to be considered a Christmas child by the Claus family or so we hoped. I inquired as to her concern for Mr. Claus's daring feat along the steep reaches of the towering chimney. "Don't let his age fool you," she replied. "He's quite resilient, and just warming up his chops for his upcoming Christmas Eve journey around the world. I never lose confidence in him," she said with a smile and tilt of the head. Knowing that behind every great man is a greater woman; at least that's what Mrs. Highlander always tells me, I then asked. "After all the centuries you've been together, it's obvious you've been carrying him all along, haven't you?" Her friendly smile and loving eyes spoke silent words to me as the nod of her head confirmed my inquiry. Leaving Mrs. Claus to tend to her many other guests, Mrs. Highlander and I moved away and turned our attention towards Santa high upon the chimney. I couldn't help but comment to Mrs. Highlander, "For a woman her age, that Mrs. Claus is a good looking lady," Mrs. Highlander just gave me a nod and smiled. I positioned myself near the deck railing as I watched Santa leave the chimney top guests behind and make his way to the edge of the cliff for another performance, I mean training exercise. Walking out onto no-mans land, (kids don't try this at home or anywhere here in the park without being accompanied by an pre-approved certified climber) Santa hooked up his rappelling line to his harness making ready for his next departure. Just before takeoff he bids his chimney top companions a fond farewell and sincere "Merry Christmas." Rappelling bent kneed down the rock face, Santa halts at the edge of a sheer drop off, as he looks at the crowd standing along the deck by the gift shop and waves to the crowd while yelling "Merry Christmas Everybody" before jumping off into the no-fly zone. Sliding down the rappelling line he stops in mid-air and shouts "Hi Ho Silver," no wait, that's another superhero. 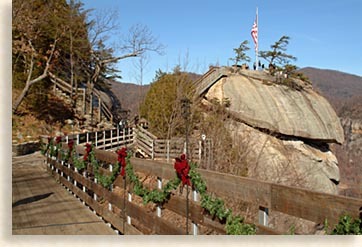 Santa actually shouted once again "Merry Christmas Everyone, Merry Christmas from Chimney Rock North Carolina," before sliding down the line and out of sight. This was great fun and very exciting to us spectators, what a sight, you really have to be there to get the true natural rush from watching this feat. Knowing what goes down must come back up I remembered Mrs. Claus telling us that Santa only has magical powers on that special night of Christmas Eve, when both Santa and the reindeer can't help but to fly. Having this secret information revealed to me, I positioned myself by the elevator awaiting his arrival, and there he was, transported back up again using modern technological magic consisting of steel cables and a motor drive. Santa, being the modest mythological creature he is said, "No autographs please, I must get back to my training exercises," you have to respect his star status. Mrs. Claus was there to greet him and congratulate him on another fine run and allowed me to get in a quick photo before returning to their guest and preparing for another descent. Realizing that if that disappearing act looked that good from the top, I bet it would look pretty good from the bottom. I hopped onto the elevator and rappelled down the elevator shaft with the elevator conductor as I shouted, "Hey look, no hands," the conductor shook her head and smiled a little, it must have been an old joke. I arrived just in time for Santa's next run and sure enough I was right, it was just as thrilling to watch from below. Several times Santa stopped along the way and wished everyone a "Merry, Merry Christmas," and happy "Hi Ho! Hi Ho!" no that's the 7 Dwarfs. I really need to brush up on my Fairy Tales, Super Heroes' and Mythological Characters. While waiting for Santa to come up the trail I had a chance to observe some young rappelling and rock climbing Santas in training. For a modest fee you to can learn the art of rock climbing and rappelling at Chimney Rock with the aid of a local climbing professional. I think I'll stick to staying flat-footed. Having to decide whether I should be clinging to the rock, grasping a rappelling line or holding onto my camera might be too pressing for my limited mental abilities. It's an exciting sport and recreation for the brave of heart; if that's you, contact the park office at 828-625-9611 or toll-free at 800-277-9611. 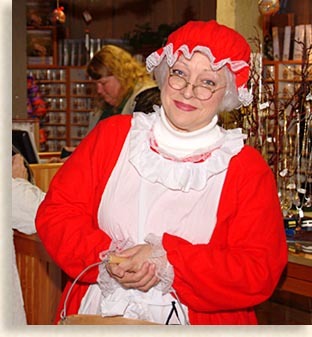 As Santa came around the trail at the bottom of Chimney Rock, Mrs. Claus was there once again chatting with the children of all ages, awaiting her one true love to arrive. Santa was a little too busy for "kissy face" with Mrs. Claus now, you know, with the sun ever lowering on the horizon, "we're burning up daylight mama," he called to her as he strolled on by. 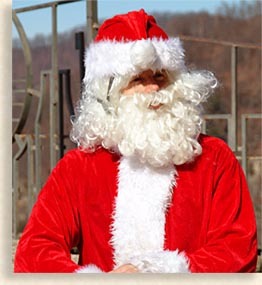 I just had to ask Mrs. Claus a question that was bothering me, "Has Mr. Claus been ill, he's looking a little lean?" "Oh no, he's just fine, fit as a fiddle" she replied, "In today's times even Mr. Claus and I have to be health-conscious, you know, all those cardiovascular and cholesterol concerns. We're planning a new PR campaign on the Internet next year for healthy living, including healthy cookie recipes and other snacks. Santa is so well known and loved that he has to be a good role model for all children today and in the future. I do have to get him back up to the North Pole right away and plump him up with healthy foods for his Christmas Eve flight. He needs that extra layer of fat to keep warm on those high-altitudes flights and cold northern and deep, deep southern hemisphere climates. After that, its back to the treadmill for him, I think he's cute don't you?" I replied, "Well I don't know about Santa but you're looking like a pretty lean, mean, cookie making machine yourself." Why am I hitting on Mrs. Claus? I've never done that before, must be the red dress and cute red hat she was wearing. I told Mrs. Claus I had to get back to work now when the truth is; I heard a voice in my head saying, "beware of that naughty and nice list." I exited the Ski Lounge Gift Shop and Deli eyeballing the tasty looking pizza again, now I know why they put it near the doorway. Crossing the wooden deck I passed Mrs. Highlander who was busy making new friends with just about everyone she met. I made my way over to the end of the deck and climbed the long staircase to the crown of Chimney Rock. There was Santa, holding court in his royal red attire asking the little children what they wanted for Christmas while the grown ups were pressing him hard for expensive things and such, the latter explains why Santa was always so eager to escape down the rope again. Thinking that Santa was magical all year round, it was a little shocking to find out the magic only appeared on Christmas Eve Night, but then again it is such a special night. My curiosity led me to follow Santa over to his rappelling position. I asked, "Santa how did you learn to rappel so well?" He answered, "My ancestors passed it down to me. My great-grandfather Saint Nicolas passed it down to my grandfather Sinta Klaus, who passed it down to me Santa Claus. I have been using rock rappelling to train ever since." I had to ask. "What about your father? You didn't mention him." Santa replied, "Some think he got lost on one of the Christmas flights, too proud to ask for directions. Others say he flew away and joined the flying circus; he was always a big showoff. His name was Kris Kringle, you've probably heard of him. I don't like to talk about it much, but I do enjoy the work. Mrs. Claus helps me forget about the abandonment issues. That's why I love kids so much." "Fine woman you got there Santa," I replied. Santa just raised an eyebrow at me. Curious about this magical rappelling equipment Santa had, I photographed his rigging and asked a mountain adventure colleague of mine, Tim Noland, what he and his adventure ropin' and climbin' sidekick Brandon Vaughn could tell me about the equipment Santa was using to support his passion for effective Christmas services. Tim's reply: "Hey Highlander, I'll do my best but I haven't really been involved in rock climbing for some time. 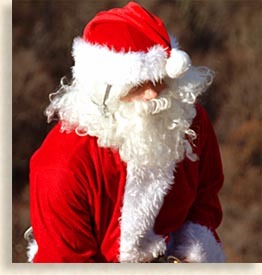 In photo 1 Santa is in the standard rappel position, his right hand is his brake hand, the one that stops his descent. Most people usually put it behind their back but with this new equipment you probably have to feed it through to descend. 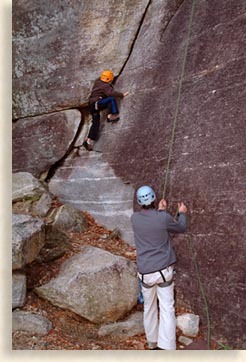 Photo 2 is considered a free rappel because his feet are off the rock. Photo 3 & 4, are the anchor points, with four points of attachment or anchors, usually on a rock this size you use cam type anchors or maybe even drill and attach bolts if not a protected rock. Forest Service and State Parks such as Chimney Rock won't let you drill holes and cement in bolts, the bolts have to be hammered in to hold. The orange and yellow things are carabiners and the gray and purple are tubular webbing. The rope looks like gym-line, can't tell for sure. The knots closest to top are figure eights and the next one looks like an overhand, making the loop to attach to the larger rappel rope. The two large carabiners are auto locking with opposing gates, facing opposite directions so if one fails the other catches you, not exactly sure about big knot, kinda' looks like a bowline but maybe Brandon can tell us, I'll try to contact him. Photo 5, couldn't tell you what he's doing but great shot. Maybe it's another carabiner. He has climber shoes on thou, smart Santa. In photo 6 he is rigging a prussik on for additional safety before going off in the free rappel. A prussik can be used to stop or to climb back up, ascend. The more times you wrap the cord the slower you go and depending on the direction of the wrap up or down. Photo 7, last step is a doozy; he is feeding rope through before going over the edge because it tries to pull you into the wall and toward your knees, it takes real skill to hold this point. It is better to have a couple feet of slack so you don't slam into the wall or slip. As you go over, you leave your feet planted and your upper body goes upside down slightly until you're free hanging. So when can we go rappel the rock? Ha Ha." Thanks Tim for all your help, I'm sure our non-climber Highlander readers will appreciate your professional input, and lets leave the comedy to the Highlander. Thanks again, tell our daughter Tara (your wife) we love her and always believe in the Christmas Miracle. By the time I finished this shot in the pan, featured Highlander story we hadn't heard back from Tim's trusted sidekick Brandon, hope he didn't fall into a batch of distilled moon-spirits again this holiday season. I watched Santa as he spent more quality time with his holiday guests atop of Chimney Rock, having his picture taken with others, answering questions about the mysterious northern lights at the north pole, what the reindeer do in the off season, how many toys does he make a year and what's his favorite snack made by Mrs. Claus. I imagine that would be cookies and milk. That's my favorite snack too, must have some Santa DNA in me. I personally asked Santa how he was able to keep the Elves working year round without a vacation? "Don't get me started about the Elves Union again, and besides they get Christmas Eve and Christmas Day off and I don't." And when it comes to the return packages, I'm just glad I am out of the loop at that point. I stood there with my mountaintop companions by my side as we watched Santa disappear over the edge and out of sight one last time, like a vapor he and Mrs. Claus were gone. Just before he slipped out of sight and shouted out one more time, "Merry Christmas, Merry Christmas Everyone," I turned to one of my new companions and said, "He must be crazy to do this, but I bet he loves Jesus, I know I do, but I'm still not brave enough to do that." Christmas at Chimney Rock was a great and fun experience for Mrs. Highlander and myself. It was obvious that all of the other attending guests were having a wonderful time, as they caught the holiday spirit of this unique event. This is an experience you've got to see first hand in order to truly appreciate. Photos and words come short of a personal eyewitness. Bring the kids, the grandparents and your friends; it's a holiday tale that will be told for many years to come. Mrs. Highlander and I drove 3-hours each way and after personally witnessing this experience, we would have gladly driven longer. From the staff of Chimney Rock at Chimney Rock State Park North Carolina and the staff at the Blue Ridge Highlander, we wish you all a Very Merry Christmas and a Happy New Year. See you next year Santa Claus, and to you Mrs. Claus, what can I say?